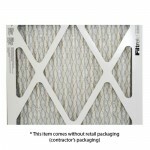 3M Filtrete Air Filter, MERV 7 - Dust/Pollen Reduction (500 MPR) - 20"x30"x1"
WestsideWholesales presents the product of the company that is committed to scientific research and makes everything to enhance our life. 3M Filtrate Air Purifier Filters belong to one of 55,000 items that US multinational conglomerate corporation deliver. Minnesota-based company manufactures its products all over the world. It has 84,000 employees in different countries. The experts of the company share their achievements in scientific journals. They work with the governments and scientific researchers globally. 3M Filtrate Air Purifier Filters reflect the quality standards of the company. Opposing to many filters that just block the entrance filters from this company can easily captivate the impurities only. They let the air flow pass through the filter. There are a lot of particles in the house that can bring harm to the members of the family. People inhale dust and tiny harmful substances that destroy health of the person. Mold can be especially dangerous for health of the householders. It can provoke dangerous diseases. Some of the diseases may have lethal outcome. It is also undesirable for the child to grow in such atmosphere. The specialists proved that children are more vulnerable to diseases under the circumstances and develop slowly. However, fibers in the filter can attract impurities like magnets. These are positively charged and negatively charged fibers. This is more effective approach in comparison with many other used in the filters. Washable filters are not as effective as 3M Filtrate Air Purifier Filters. The same is true for woven fiberglass. The main principle of the technology is the electrostatic charge. Ultra Allergen Reduction (1000 MPR). Determine the model required to your air purification system. Customers need to read more detailed description of the filters that WestsideWholesales offers in the store.